After 1,369 miles in a cool Dodge Avenger, missing my wife and kids tremendously, a bunch of hotel breakfasts and fast food lunches, a combination of podcasts, books on CD, and satellite radio, seven museums, four battlefields, and a lot of Diet Coke … what did I get out of this trip? My appreciation for our history as a nation continues to increase. I mentioned it many times, but there is something truly special about walking in the footsteps of the past, to see the places that I have read, talked, and taught about, and look at the feats of the ordinary doing the extraordinary. I was able to see the highs and lows of our history. As I travel and talk to the people visiting the same sites, I am happy that I am not alone in this appreciation. Hopefully, I can continue to convey this enthusiasm to my students, colleagues, and friends. My content knowledge about the Civil Rights Movement, the Western theater of the Civil War, and World War II grew by leaps and bounds in five short days. The historical sites are the best teachers. I can’t find a better book, video, or website to learn about what happened, why it happened, and why it’s important. Adding this additional understanding into my teaching is exciting. I hate to say it, but I am ready for December (Civil War), April (WWII), and May (Civil Rights) of next school year! I think the most important visits of my trip dealt with the Civil Rights Movement. Not only did I learn much more about what happened in the South, in those well known venues of Montgomery, Birmingham, Selma, and Atlanta, but I also saw how that part of our history is so important to our African American community. While that may seem obvious, it takes on a whole new light standing at an exhibit about segregation next to someone who experienced it, talking to her grandchildren and recalling her memories. I can never come close to putting myself or my students in that situation, but I can hopefully bring us closer to understanding that perspective. I also enjoyed documenting my trip with postings, images, audio, and video. It was exciting every night to post my experiences, and even more exciting to check in on who was able to read about the trip and make a comment on the blog. I can use this as an example of education communication when Matt Montagne and I present at the National Council of the Social Studies annual Conference in Houston in November. Overall the trip gave some time to collect my thoughts after a challenging school year, see some places that I have always wanted to see, increase my knowledge and understating of our nation’s past, strengthen my passion for teaching American history, and be thankful to teach at a school that supports such a trip. When I told the various people I met what I was doing, they were amazed – first, that I would do it, and second, that my school would support and pay for it! I also realized that I miss my family incredibly, and that I am glad to be going home. Ending my trip with a visit to the D Day Museum was perfect. While my trip had the dual focus of the Civil Rights Movement and the Civil War, I couldn’t leave this part of the country without coming to New Orleans and seeing the museum. I have been looking forward to the visit since I learned of the museum years ago, and I wasn’t disappointed. My visit began with a discussion with Kenneth Hoffman, the Director of Education for the museum. He described some of the educational components offered by his staff, including videoconferencing on different topics of interest. This could become an exciting part of our study of WWII in the spring. Mr. Hoffman also discussed the importance of developing a sense of place in teaching history, something that is challenging but essential. I really enjoyed our conversation, as it reinforced why I was traveling in the first place and will hopefully lead to additional communication with him and the museum. The museum itself is full of content, audio, video, and images dealing with World War II. 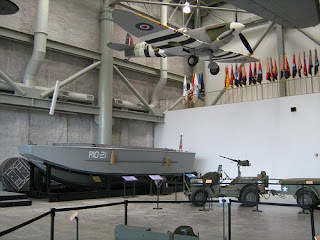 The main exhibits are on Operation Overlord in Normandy and the various D-Days in the Pacific theater. 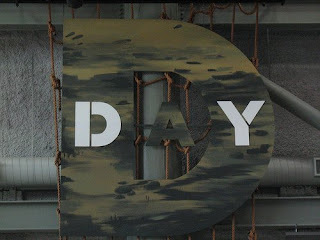 The D-Day exhibit covered every possible aspect of the invasion. While I knew a fair amount, I walked away with a more complete understanding of D-Day, especially after listening to the various oral histories that are part of the exhibit. The best resource was Mr. Blakey, a guide who was a paratrooper on June 6, 1944. He is the true example of living history. The Pacific theater exhibit gave me some additional insight into the complicated military operations in that arena. I also learned much more about the racist propaganda used on both sides of the war (US and Japan). The exhibit ended with a very poignant display on the proposed attack on Japanese mainland and the bombing of Hiroshima and Nagasaki. The museum is currently undergoing a huge expansion project, and I am sure I will return in the future. They hopefully will have an educators’ conference either at the museum or in New Orleans. If not, it may be a trip for the Tafts – all five or just two. 1300 monuments – and I think I saw everyone of them (and loved every minute of it). My visit to Vicksburg National Military Park was awesome. The weather even cooperated – it didn’t break 90 while I was touring. I started at the Visitor Center, checked out the exhibits, grabbed a CD and tour book, and hit the road. 4 hours later, I didn’t have enough! The first thing I realized about Vicksburg was how different it was from Shiloh. Both are beautiful, but the topography is as different as night and day. There isn’t a single flat spot on the battlefield, which played into the battle tremendously. It’s interesting that Grant was the commander at both battles. I don’t think he gets much credit for being able to succeed on different types venues of war. The park is gorgeous this time of year. It didn’t look as wooded back in 1863, but it was thick and lush. The driving tour takes you up and down, around winding roads, and near every essential spot on the battlefield. One of my favorite spots on the battlefield was the Illinois monument (even though I am downright allergic to all things Illinois). My young historian Caroline B and her parents sent me there with a mission – to find the name of her great great great grandfather on the wall of 36,000+ Illinois men who served at Vicksburg. Finding the name was fun for the thrill of the chase, but it also gave me a disjointed link to the battle. I will have to begin some research on my own ancestors’ role in the Civil War … and then go follow in their footsteps. While the vista of the battlefield is amazing from all of the open areas, my favorite aspect were the monuments from each state. I felt strangely at home touring the Wisconsin monument (yup, it’s official, I’m a Wisconsinite – but I still love my Detroit teams). The Kentucky monument is way too cool – Lincoln and Davis standing next to each other. The museum and exhibit on the U.S. Cairo is something that I wasn’t expecting. I knew it was there, but I had no idea about how basically cool it would be to see the skeleton of a huge Union ironclad gunboat preserved and presented under an enormous canopy. It has to be seen to be appreciated. Of course, I also was humbled by the numbers involved, especially at the National Cemetery. Only the Union soldiers are interred there, and there are 13,000 unknown men. Keeping in mind that the number only reflects probably half of the casualties … wow. The battlefield lives up to the overall importance of Vicksburg as the key to the war, the Gibraltar of the Mississippi, the turning point of the conflict, and the hallowed ground for the thousands engaged. It's a must see. After recently reading two books and attending multiple Civil Rights museums exhibits in the past two days, I felt that I knew enough … but, as usual, I was wrong. The National Civil Rights Museum is full of so much information that I felt I was going back to school (but that’s why I am on this trip). The exhibits are almost a media overload – text, primary documents, images, video, and newspapers (my favorite part) telling the story of nearly every aspect of the movement. I learned about sit-ins and boycotts before the big ones, organizations that I had never heard of, the impact of WWII, different reactions to Brown v. Board, more insight into Birmingham and Selma, and the Freedom from Fear March of James Meredith. I also plan on investigating the Chicago Movement more in-depth. The museum covers the full spectrum of the movement, but there is only one reason for its location in Memphis – MLK’s assassination in the Lorraine Motel in 1968. To see the balcony that I have seen so many times before is one thing … but to see it from inside the hotel, and see his room as it was on April 4, and listen to the song he asked to be sung the next day, … again, walking in the footsteps of history. Across the street, the museum extends to examine the assassination itself. The video presentation on King’s final days and the timeline of his last hours is so detailed, you think you are there. Looking out the window of the supposed shooting site is downright eerie. The artifacts are amazing – the actual bullet? Come on! – and the conspiracy theories are discussed as well. It’s pretty powerful to travel the South and see the Civil Rights Movement as part of a continuum. Starting at King’s birthplace and younger years, moving to Montgomery, Selma, and Birmingham ( a little out of order, but that’s all right), and ending in Memphis, I feel like I have a much better understanding of and appreciation for the movement and the individuals involved. Now, I need to spread the word – that’s what my friend from Birmingham, Mr. Sanders, told me I must do. As an aside, I didn't get to see much more of Memphis (no BBQ or Beale Street), but I am confident that I will be back again - with my family. There is a little something for everyone (but no octopus for Charlie). I always thought that nothing could match the battlefields that I have already seen – the sheer size and importance of Gettysburg, the beauty of Antietam on a November day, the poignancy of Cold Harbor, the drama of Fredericksburg – but Shiloh is now my new favorite. The battlefield is pristinely preserved, mostly because it is in the middle of the countryside of southern Tennessee. As I already posted, the cemetery is an attraction in itself. While the visitor center isn’t as high-tech as some of the others, it does have some fantastic militaria. As I drove the battlefield with an audio tour and three maps, it was easy to understand the flow of the battle. The human stories within the battle are fascinating – Johnston’s tin cup, the valor of the Federals holding the Sunken Road, the horrible scene that must have taken place at Bloody Pond, and many more. For the first time, I focused on the specific role of the Wisconsin regiments engaged in the battle, making the experience more personal to myself (and hopefully my students). It was also fun to narrate some video tours of a few of the sites on the battlefield. If you ever get a chance, Shiloh is worth the effort. It’s only about two hours outside of Memphis, and with Corinth (3o minutes away), it is a full day of Civil War love. The Corinth Civil War Interpretive Center is one of the best Civil War spots I have visited. As you walk up to the center, your pass over soldier items embedded into the sidewalk - the "detrius of war". The center has a fantastic educational exhibit on the basics of the coming of the war, and I will use some of the North/South comparisons in class next year. The exhibit clearly explained the importance of the Corinth area, something I had no idea about. It also has an awesome multimedia overview of Shiloh. The real highlight was the courtyard behind the center, which contains the sculpture fountain called "The Stream of American History". It's difficult to accurately describe with just words, so I tried to do a narrative video tour of the beautiful work of art and history. Combined with the Shiloh National Military Park, this site is a must see for anyone with any level of interest in the war. I will definitely be back - hopefully sooner than later. There are battlefields, and then there is Shiloh. The expanse, the preservation, the markers and monuments, the beautiful natural vista … it’s tough to beat for a Civil War fan. I am doing a more intense tour of the military park tomorrow, but I drove around it this evening to get the lay of the land and visit the national cemetery. There is something about walking among the graves markers as the sun is setting. I did the same thing at Fredericksburg two years ago with a similar emotional result. The tranquility of the setting and the timing was awesome, and reminded me of one of my favorite CW poems (I’m glad I had a copy in my notes). Wisconsin has a few prominent markers, including the 6 color bearers who fell during the battle and are buried overlooking the Tennessee River. I couldn’t have asked for a better end to the day.